Snakes are out and about and generally at the Newtown VC we see pet’s envenomated by snakes between the months of September to March, although it is possible at any time of the year. In Geelong we see more bites occurring along the Barwon River and near other water sources such as the lakes in Lara. 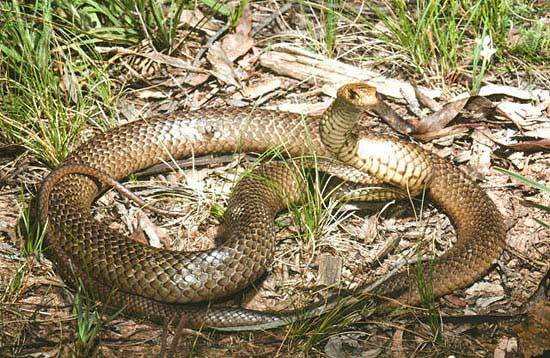 Tiger snakes like to live near water. They can often be seen sunning themselves on the walking path close to the Barwon Edge Boathouse cafe! Brown snake, Black snake and Copperhead snake envenomations also occur, but they tend to be in drier locations away from water sources. WHAT DOES A SNAKE BITE LOOK LIKE? A common reported history for a potential snake bite case is a dog who has been on a walk, was heard yelp while sniffing in long grass or bushes, and then seems to vomit or get wobbly shortly afterwards. Often some clients will find their dog barking at a snake in their back yard and there may not be any obvious reported symptoms. Cats are commonly bitten by snakes, however can present weak and lethargic up to 24hrs after being envenomated. Essentially on a warm, sunny day between September and March, and if your pet is showing any signs of vomiting, weakness, breathing problems or vagueness- especially after a walk, then PLEASE seek urgent veterinary advice. DO NOT attempt to kill the snake! This puts YOUR OWN LIFE AT RISK and WILL NOT help your vet identify the snake. There are other, much safer ways to determine this. SO HOW DOES MY VET DIAGNOSE A SNAKE HAS BITTEN MY PET? Well. This depends. It can depend on the type of snake that did the biting and how much venom is delivered while biting your pet. Sometimes a pet may be bitten by a snake, but no venom was injected by the snake. This is called a dry bite. Sometimes the snake will inject enough venom to cause mild symptoms, or a dose of venom to cause lethal symptoms. Sometimes a snake will inject multiple lethal doses of venom, causing severe symptoms to occur very soon after (within 15-30 minutes) It depends on how much venom was injected that will determine the time it takes for symptoms to occur. As you can appreciate, a snake bite case can look very different from one animal to the next and between species. To clarify this process, it helps to understand what types of chemicals are found in snake venom. Understanding this can help explain why your vet may suggest different tests to check to see if your pet has been bitten by a snake or not. The first thing that is undertaken is a thorough clinical exam. This is a screening test to look for obvious dysfunction in the neurological, cardiovascular or respiratory symptoms. This might include vomiting, weakness or a collapsing episode, or even a shallow and weak breathing pattern. It might also include signs of hypersalivation or muscle tremors, or large dilated pupils. Cats can just be weak and floppy. Some animals pass red or orange coloured urine. At this stage it may be possible to make a presumptive diagnosis based on a suspicious history, and a deteriorating patient, and it may be suggested that immediate treatment with anti-venom, and without blood or urine testing, may be the safest way to proceed. The treatment for a snake envenomation is the administration of intravenous snake anti-venom. It is important to give this as soon as possible to get the best prognosis for a recovery from a snake bite. Alternatively if the diagnosis is not clear and if we would like to make sure we are not missing a snake envenomation in the early stages. Sometimes it is necessary to employ a number of tests to make a diagnosis of snake bite. SO WHY DON’T YOU JUST TREAT MY PET? Well. It can be expensive. Although it is not the first thing your vet will discuss with you, it is still important to be well informed about how much these treatments cost. This information can help you make an informed decision that is right for you and your pet about whether or not you decide to treat your pet. Essentially- snake bite cases can be expensive, with a relatively uncomplicated snake bite case costing up to $2000. Unfortunately snake anti-venom is expensive for vet clinics to buys and a single treatment usually costs between $800-$900 dollars. This cost contributes to the bulk of the treatment expenses incurred. In the event that your pet has been envenomated with a higher dose of venom when it was bitten, then more doses anti-venom may be required to reverse the effects of the bite. Each extra dose of anti-venom is another $800-900. Complicated snake bite cases that need 2-3 or 4 doses of anti-venom, or spend time on ventilator machines(Roughly $2000/24hrs) in order to save your pet’s life, may need to be in hospital for up to a week. This can equate treatment costs of $4000+. The prognosis with this higher level care can still be quite good despite the level of critical care required, however this type of care is not for everyone. Given this, the Newtown Veterinary Clinic strongly recommend that you investigate health insurance for your pet, and clarify with the company how much will be contributed towards a snake bite case. For this reason, your vet may offer you some diagnostic tests to rule out a snake envenomation and avoid expensive and unnecessary treatments. 1) Testing the coagulation system. Many snakes have components in their venom that interferes with normal blood clotting, and so by measuring blood clotting times information can be gained that can be helpful. If the blood clotting time is very abnormal, this can often suggest a large amount of venom has been injected. However, normal blood clotting times does not rule out a snake bite. This test is quick and relatively inexpensive to run and can sometimes be helpful. Abnormal clotting times are seen very regularly in both Tiger and Brown snake envenomations. 2) Testing directly for snake venom. If bitten by a snake, it is possible to run a test called a Snake Venom Detection Kit(SVDK). Venom can be found in blood rapidly and can also be demonstrated in urine with 30minutes of a potential bite. Urine is the ideal test to run and is easy to collect from boy dogs, but less easy from girl dogs. Blood/serum can be used in the event that urine cannot be collected. The SVDK can detect very minute quantities of snake venom and can be used to give a very clear “yes” or “no” answer. The SVDK can also be used to determine the type of snake that envenomated your pet. Sometimes later on, after an envenomation, elevated levels of muscle enzymes can be seen. This is especially common with Tiger snake envenomations, as lots of snake venom can bind to the muscles. This test is useful in determining how long your pet may need to stay in hospital receiving treatment. Snake venom that is bound to the muscles will gradually over a course of weeks detach and be excreted into your pet’s urine. 4) Testing the neurological system. Once a diagnosis of snake bite has been made, you will be offered hospitalisation and treatment with snake antivenom. This is the only treatment which is proven both in human and animal medicine to be beneficial for snake envenomation. You may have heard many stories regarding the use of Vitamin C, or other anecdotal “cures”, however these is absolutely no evidence that these treatments are beneficial, and electing to try these “treatments” is risking an avoidable and painful death. Your vet, who is trained in medicine will NEVER recommend anything other than treatment including snake anti-venom. It is clearly demonstrated that anti-venom administered as early as possible to a snake envenomated patient is the most important factor in improving patient survival. Anti-venom must be administered intravenously, slowly and monitored very closely by your vet. Your pet will be monitored very closely to watch for signs of deterioration that may require further care. Your vet may recommend a single dose or anti-venom or multiple doses of anti-venom, if your pet appears severely incapacitated by a snake bite. If your pet is so severely envenomated that they are having troubles breathing, they are at risk of a respiratory arrest and dying. This happens frequently in the event of a multiple lethal dose envenomation. Treatment for this is more anti-venom. If it becomes more severe, then your vet may offer anaesthetising your pet to pass a breathing tube and to potentially put them on a ventilator machine to keep them alive. This is a machine that breathes for your pet while we are waiting for the effects of the venom to wear off. This can sometimes take up to 24hrs, but 6-12 hrs is much more likely. This type of care is available in Geelong at the emergency centre, and also at the ICU at the University of Melbourne in Werribee and can be lifesaving. Ventilator costs can be around $2000 per 24hrs and is a complex and specialised veterinary procedure. Despite this the chances of recovery can still be quite good. If a diagnosis can be made rapidly and treatment started before serious signs occur, the prognosis for a full recovery from a snake bite can be quite good. However this can change depending on the severity of the case as well.